No one wants to look plumpy or too skinny, right? We all want to look just fab!!! The word that is trending today is “healthy look”. But, how does one manage to stay healthy and look perfect? I think this question must have puzzled your mind too. Weight management is an art. If you have a balanced weight then you radiate a good personality inside out. Starting from your individuality to your thought processes… everything dazzles positivity and uniqueness. So how much weight is healthy and one should have? 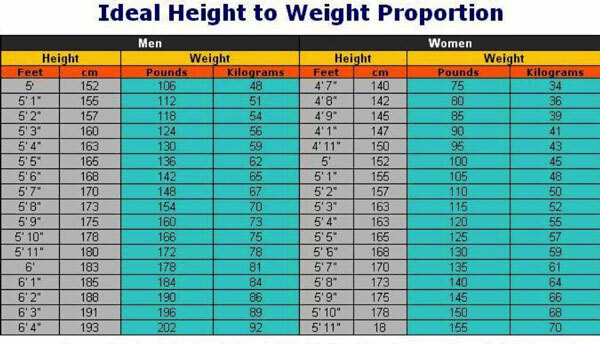 So, the chart mentioned above is an epitome of an ideal BMI with regard to your height and weight. The full form of the acronym BMI is Body Mass Index. BMI is the measure of body fat with respect to the height of an adult male and female. The quantitative aspect of our BMI is very important, as it is the reflection of the qualitative aspect of your health. The closer you are to the appropriate BMI, the healthier you are. Unfortunately, today’s sedentary and unhealthy lifestyle, detrimental food habits, and other health risks tend to throw you off the ideal weight mark. This leads to many unwanted and potential health risks, illnesses, eating disorders, insomnia, other psychological issues like depression, personality disorders and so on. Apart from these, an unhealthy weight also tends to affect your personal and social life as a whole. 1) Do not starve yourself: The first thing that may strike your mind while thinking of weight management is probably “dieting”. But, please don’t do that. Dieting without mindful eating may end in making you even more flabby or skinny. The rule of the thumb is not to starve you but to fill your platter and tummy with a balanced diet. Your dish should be enriched with a perfect blend of vital nutrients comprising of vitamins, minerals, carbohydrates, fats as well as liquids. 2) Do not skip your breakfast: Hope you have heard the saying, “eat your breakfast like a king and your dinner like a pauper”. Yes, folks! Breakfast is the most important meal of the day as it provides fuel for your body and brain for the entire day. It tends to rejuvenate and energize your body and brain after getting up from slumber and rest. Therefore, no matter how busy you are, try not to skip your breakfast at any cost. 3) Drink water, but at the right time: Most of us have a bad habit of drinking water between meals or just after/before meals. If you are following the same regime, then please try to change it as soon as possible. Try drinking water either half an hour before or after food. Drink water immediately before or after food makes your digestion process slow, sluggish and unhealthy. This also retards the production of digestive enzymes. As a result, it leads to unwanted accumulation of fats and problems in the breaking down of food nutrients. So, drink water… but at the right time! 4) Drink water, only in a sitting position: This is also one of the most significant aspects I want to tell you. If you have a habit of drinking water while standing, then unknowingly you are opening the door to innumerable ailments. Starting from throat problems to heart problems, drinking water while standing has the potential to cause many health risks and problems. So, whenever you want to drink water or juice or any fluid, try to drink the same by sitting down. The world won’t end if you spare some time for yourself and drink the stuff slowly and steadily! 5) Right is not right, left is right: Confused??? Ok, let me explain. While going to sleep, just try to analyze whether you sleep to your left side, or right side? Even if you sleep on your front or back or to your right… this should be changed. Try sleeping to your left side first for a couple of minutes and then you can change your sleeping position according to your own wish. Sleeping to the left side accelerates a healthy digestion process and exerts less pressure on your heart as well as all the vital organs of your body. 6) Walk more, breathe deep: Rather than driving your car or vehicle to a nearby destination, how about walking to it? The more your body works out naturally, the more you breathe deeply…the healthy you will be. 7) Cut alcohol and caffeine intake: Sometimes this stuff cannot be avoided but these stuff lead to accumulation of fats, toxins and pose potential health risks like tumors, cancer, etc. So, try to avoid your alcohol and caffeine intake as much as you can. 8) See a Dietician or a Nutrition Specialist: If you want to know the exact proportion of food, BMI, nutritional composition of various foods, effects of food on your body and brain…then one of the best solutions is to seek the advice of a dietician or a nutritional specialist. Once you have the knowledge related to these aspects, weight management becomes a lot more easy and worthwhile. The art of weight management is hardly a secret or a Herculean task now. It is with your own determination, knowledge, interest and motivation you can surely achieve an ideal weight and health as a whole. According to this my bf is 30 lbs Underweight lol like what?